Convert to your time zone. Bones need strength, they need anti-gravitational forces and vertical impact with rhythmic pressure and vibration. Bones thrive when integration and coordination are partnered with awareness for a higher level of function. Our bodies often collapse under their own weight and bone loss often occurs as we age. Bone can adapt to the loads it is placed under, and with repetition and the practise of MI strategies, bone can remodel through movement. Walking, running and jumping are some of the best tools for developing stronger bones. But how can we do this in safety? In Movement Intelligence, you explore moving in the horizontal plane, then add forcefulness when sitting or standing in the vertical plane and then blend them together. You learn how to sensorily listen and pace yourself with your inner world and also engage with your outer world, learning to navigate and switch between the two, as you move. The program utilizes many tools for learning, with innovation of weights and the spiral. The Bones for Life® wrap (7 meters of fabric) is used as an exoskeleton to establish a clear axial line for the spine to explore safe dynamic movement in space. Spirals with trajectories of force are generated from head to foot, building bone resiliency and stamina. Partner work and group dynamics are utilized as well. Movement Intelligence is a journey of self-guided discovery. Jennifer Groves is a Senior Movement Intelligence Trainer and Feldenkrais® practitioner. Originally, Jenny studied yoga in the Himalayas in the late 70s with Lisa Swartz and B.K.S. Iyengar in Pune. Later she studied under Naoko Yagyu in Tokyo and completed Martin Jackson’s teacher training in Sydney in the early 80s. 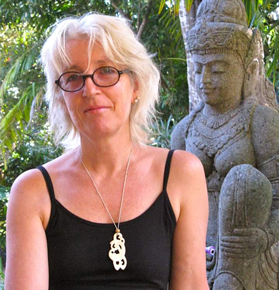 Jenny established the first yoga school in Byron Bay, ‘The Byron Yoga Studio’. This center became the hub for local, national and international yoga and Ayurveda teachers. Many of the Shire’s well-established local yoga trainers seeded from this center. After twenty years of yogic practice, Jenny’s enquiry moved into the somatic and remedial fields. It was Jenny’s own health journey that led to this deeper self-enquiry. Jenny completed her training as a Feldenkrais Practitioner in 2000. Attracted by Ruthy Alon’s somatic discoveries, she spent the next decade studying Movement Intelligence. Jenny has taught throughout Australia and the Asia Pacific Region, in Taiwan and Korea. Besides having conducted Movement Intelligence training programs, Jenny offers group workshops specializing in pre and post abdominal surgery, stress incontinence, anxiety and depression. Jenny specializes in pelvic floor conditions by teaching students how to recruit their sphincters. Jenny’s students vary from high performance athletes, dancers, choreographers, Pilates teachers/students, to stroke victims and seniors. Some students have reported these programs have reversed their osteoporosis; others have found pain relief from muscular, skeletal and/or arthritic conditions. Jenny works from her tranquil Mullumbimby studio, Douphraite House, in a small town in Northern New South Wales, Australia.